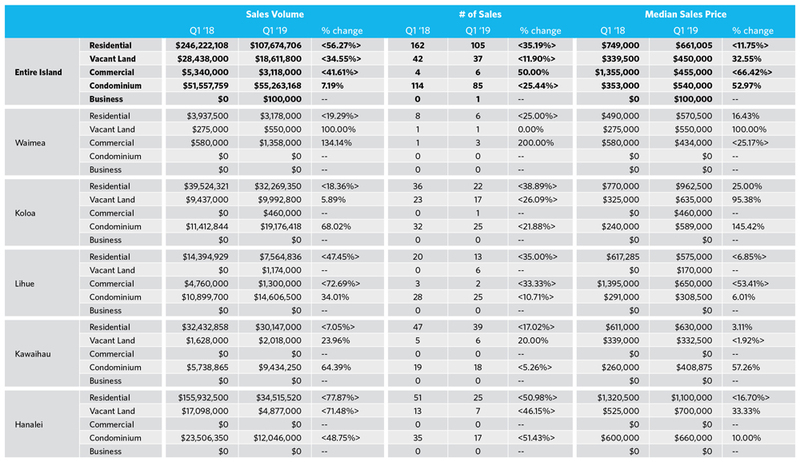 First quarter numbers for 2019 emerged as a bit of a mixed bag — strong overall, but off from the eye-popping sales volume numbers we have seen over much of the past year. Island-wide residential sales volume came in at $107.7M for the quarter, down from $246.2M during the first quarter of last year. Residential median prices for Kauai’s North Shore came in at $1.1M and for the entire island at $661K, both down more than 10% from the first quarter in 2018. Meanwhile, the condo market segment outperformed the market in a year on year comparison. Island-wide condo sales saw volume of $55M in Q1 2019, up 7.2% from Q1 2018. Island-wide condo median sales prices were up to $540K, a 53% jump from Q1 2018. North Shore condos saw a median sales price of $660K, a 10% increase from Q1 2018. If you’d like to explore the numbers a bit deeper, check out the market snapshot below or via this link for an enlarged version. A closer look at the monthly residential sales chart below shows how sales and thus sales volume have declined a bit over the past two months. 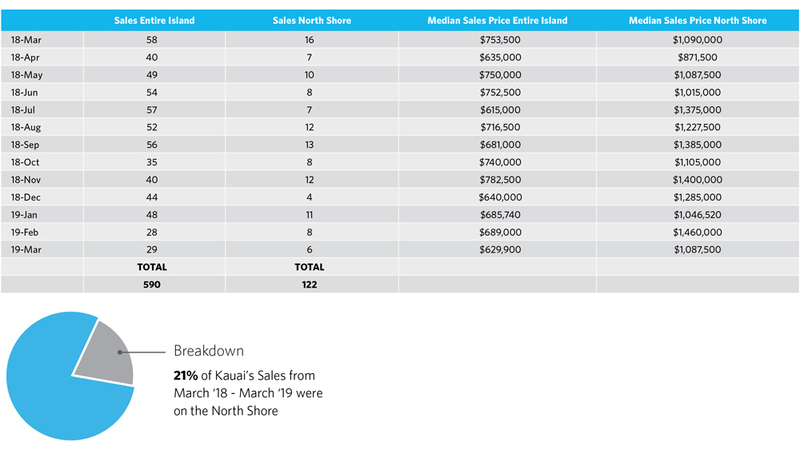 The 28 and 29 island wide residential sales in February and March, respectively, are the fewest sales during any monthly period of the sample. Though monthly sales on the North Shore were also at the lower end of the range seen across the sample, the occurrence of such values is more common. At the same time, median prices for the month of March (as well as January and February), both island wide and on the north shore were at levels also commonly seen over the sample period. 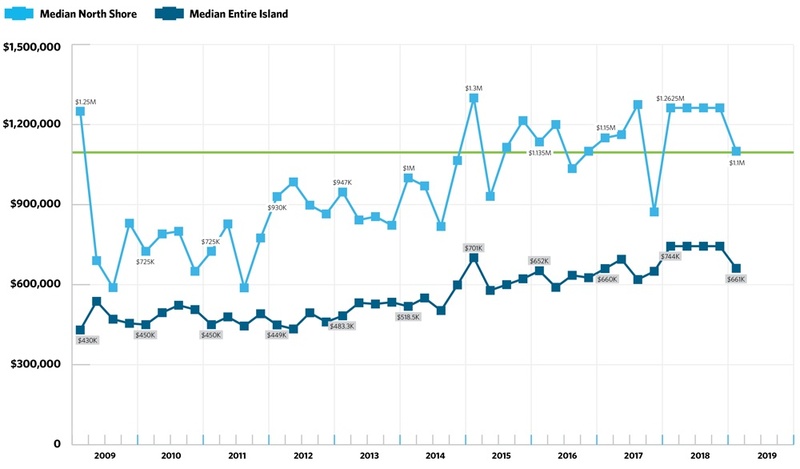 The graphic below shows the past 11 years of quarterly residential median sales prices for the entire island, as well as the North Shore. This formulation of the data also tells a strong story on pricing. Although this past quarter saw a pullback of both island-wide and north shore median residential prices, it’s clear that prices are historically very strong for both metrics and the drop in median level prices is relatively small as well. If it is a sign of things yet to come, the past few weeks have seen far more market activity and underlying indicators suggest that the second quarter is supporting a very healthy real estate market. According to one local home inspector, his business saw a record volume of home inspections (which are highly correlated with sales and sales volume) during the past three week period.